Winterhook is the perfect beer to keep warm during cold months after shoveling snow, shredding some powder, or playing hooky to can catch the game. Since it was first brewed, Redhook’s Winterhook has changed slightly each year to celebrate the season and keep everyone on their toes. After all, no one likes getting the same gift twice. The 28th version of Winterhook brewed for this year offers a rich caramel body that balances a big malt backbone with the aggressively dry hopped brew, making this year’s winter ale slightly naughty and very nice. The beer pours a clear dark amber with orange hues and a off white head. The nose is modest with sweet caramel malt aromas and a touch of floral hops. That was a tingling almost refreshing first sip with a slight hop bite on the finish. The taste starts out with a touch of malt sweetness up front followed by a tingling effervescence as this ale washes over the tongue in the middle of the sip. There is a slight hop robustness and earthiness that builds toward the back-end. The back-end is fairly easy drinking with a modest hesitation at the top of the swallow. The finish is nice with sweet caramel malt flavors with nutty notes. There is also and American hop presence on the finish that add a crisp cleanliness to the finish. The final aftertaste is a touch of caramel malt notes. The hop bite gives this winter warmer a nice slant on the English Winter Warmer style. However there is still that classic English caramel malt flavor and earthiness of the traditional style. I really like this one; classic with an American touch on the finish. 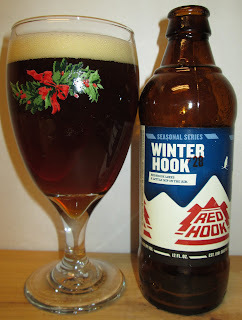 B+ | Red Hook Winter Hook is a very good Winter Warmer with classic caramel malts with toasted notes, a tingling effervescent mouthfeel and a nice hop bite twist on the style that makes this an American Winter Warmer.